Update on October 13, 2017: Click here to go to the updated version of this tutorial. Beaver Builder is a pretty good plugin for easily creating content rows for Pages via drag and drop. 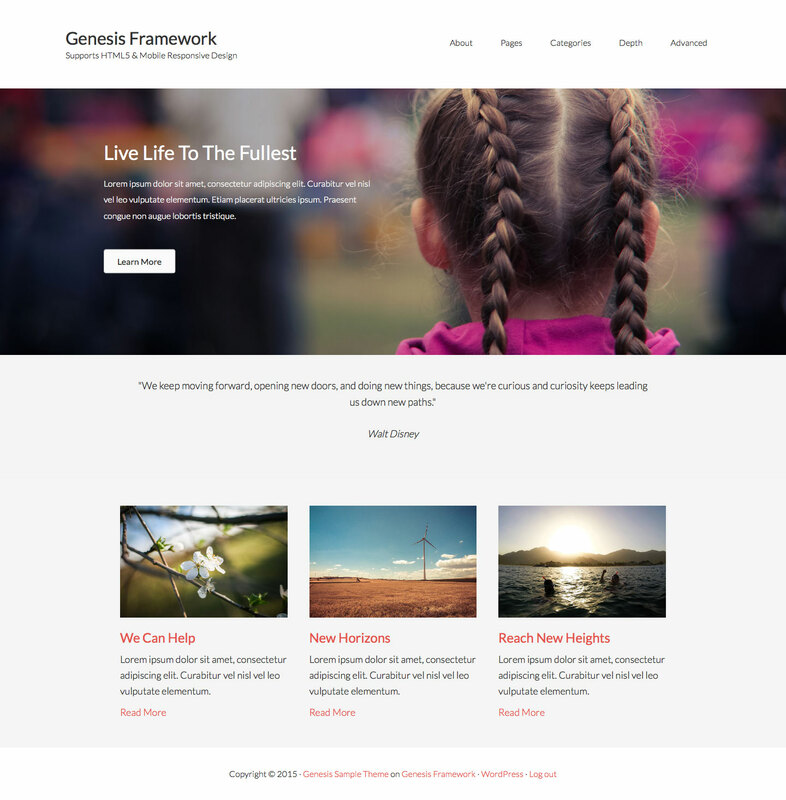 In this article I share a modification of code from Front Page Template for Full Width Sections in Genesis tutorial for displaying Pages built with Beaver Builder to appear full width. * Add attributes for site-inner element, since we're removing 'content'. * @param array $attributes Existing attributes. * @return array Amended attributes. the_post(); // sets the 'in the loop' property to true. To make a static Page in which you are using Beaver Builder go full width, edit that Page and apply Full Width Page Template to it. If you would like to have a full width front page with Beaver, create a static Page named say, Home and set it as Front page at Settings > Reading. * Use page_beaver.php for all static Pages. Out of all these the only ones this works on is the ambiance pro theme and beautiful theme. I’m new to Genesis so can you explain which themes this will work with? Unless otherwise specified, all the tutorials on my site are tested only in Genesis Sample child theme. Any specific child theme that you would like to use and make this work in? I wanted to test this out on any of the themes with full-width headers, such as Centric or Minimum Pro, but it didn’t work. I’m guessing its a css issue, which is hard for me because I’m not great at it. The plan was to use this template as a universal solution for the these types of themes. I found that the Ambiance theme doesn’t need the css, only the template, and it automatically makes everything full width. The Beautiful Pro theme works perfectly with the css and the template. So not sure what makes the Beautiful Pro theme different than the Centric or Minimum Pro. All in all, thank you though, this template gives me a good place to start. Can you provide details of what exactly is not working say, in Centric Pro? Any screenshots? And now it all works well. I guess I have to get used to editing css a bit more. Colin doesn’t use a template, only css, but I found that using your template allowed me to get rid of a .page-title padding gap that was underneath the header. Can very well be done w/o creating a template using CSS alone. But the overall HTML markup will not be as clean as this. I would like to be have Full Width Page Template in Minimum Pro for Beaver Builder. Can I use the code from this post? It should. Please give it a try and let me know. I am enjoying your tutorials and have used a few already. We are trying to use Beaver Builder in combination with Altitude Pro to create some nice inner pages and would like to use a Full Width Page Template for this. We have tried the code you provide above but there is a gap between the header and the beginning of the first row. Actually, we would like the first row to be under the header, right at the top of the screen. We hope that by setting the header’s background to ‘transparent’, that we can re-create the header effect of the home page in Altitude Pro. What changes do we need to make to your code to achieve this ? I can’t seem to get this to go full-width on the Enterprise Pro theme. Any ideas? Do you know of a way to make a Beaver Builder row fill the entire viewport? There is only one row and I had to set the bottom padding in the row to 250 in order for it to fill most of the screen. However, on larger screens, the background image does not fill the screen. I just sized my browser to 2560 x 1440 and see that background is taking up the full viewport size. Hello there thanks for sharing this post! I am not having any luck at all with full width using this method with Genesis Executive Pro. I can remove my margins in the css and adjust the margins in beaverbuilder to make it work, but it removes the margins in all of the pages on the site, I want to be able to use beaverbuilder on certain pages and the reg editor on others. I can not seem to find a solution that seems to work for me. The reason I want full width is on my home page, I have a slider that is full and my width is 1440. I have sections I built with beaverbuilder that has a full width background that i want 1140 wide. IF I apply any margin in css it will not allow beaver ti be 1140 wide, but I need the margins for my reg content in editor on some pages. One question on the header — I’m trying to remove the header and use Beaver Builder to create the logo/navigation for a landing page. So I added this code below to your template but the Genesis header and navigation still appear. I’m using Digital Pro. I’ve sorted another solution to the menu issue. However do you know why on Digital Pro that it doesn’t assign the Body Class fl-builder-full when the page is set as the home page? Maybe something in the theme overrides this page template? The page template works until going to Reading and setting the page as the front page. At least in Digital Pro, it stopped assigning the fl-builder-class and so it lost the max-width and padding CSS updates. I’m having the same issue with Digital Pro and Wellness Pro not showing the new page class on the home page. I found a hack by adding the “.home” class in the CSS with the “.fl-builder-full” – not sure if it’s the best fix, but seems to be working. Static front page’s template in WordPress is front-page.php. Have you guys tried creating it with the same code as in page_beaver.php? Very helpful Sridhar. I got this to work in Altitiude. The only thing is that there is still some white space between the header and the beginning of the first row. Do you know how that can be removed? thanks! sure it is provided now in my response field after name and email – Thank you! That’s coming from 170px of top margin for .site-inner. Change it to match the height of .site-header which is 87px. Then you would need to look at inner pages and smaller widths and make adjustments accordingly. Thank you Sridhar. I assume this requires CSS. I am unfortunately a beginner. Will you be able to advise what sort of code of CSS I need to use exactly? Much appreciated! How can I do the same thing for posts and have them full width too? It worked perfectly for pages with Altitude pro theme and BB on genesis so thank you, but really need to be able to controls posts layout in the same way if possible? Great ! Many thanks Sridhar ! What to add to the PHP to make comments section show on the new full width page template for altitude pro? I see from your Facebook comment that you figured this out. will display the existing comments for that Page. What do you think about the Genesis Dambuster plugin? I use it in conjunction with Beaver Builder and find it helpful to achieve similar results. I have not used that plugin. I prefer not to use plugins as much as possible if the same can be done with code in functions.php/custom templates. I agree with Sridhar. If it can be achieved with code then that is better. Genesis Dambuster is handy for some use scenarios and people though. There are some great videos on YouTube as to how Genesis Dambuster plays into the Beaver Builder + Genesis set up and allowing page by page or post by post checkboxes to hide all or just certain Genesis elements like the entry title and so on. In case anyone finds this useful. I use stock code like this with beaver builder. I basically add the below PHP with the conditional checks to see if beaver builder is active on a page, if so it then removes the title, and makes it full width etc so you can easily press on with beaver builder. This removes the need for genesis dambuster and other functions set globally. You can set them only on pages if the plugin is being used. You simply add more remove_actions for your genesis child theme to remove more elements if you don’t them and ensure you have no sidebar set in the genesis layouts before going to page builder. * Add attributes for site-inner element. * Echo the necessary "Full Page Width" styles into the head of the page. * Credit for the following CSS goes to the developer of the "Genesis Dambuster"
* Plugin as this CSS is an edited version of that Plugin's full-width.css file. The above approach if using Genesis Extender plugin means you don’t have to create a custom template OR set it every time you create a new page and want to use Beaver Builder. This code is exactly what I was looking for, thanks. I just completed a class on PHP so should probably try to use those skills. Plus, less plugins is a good thing right? So….this code goes in the functions.php? If so, at top? Thank you so much! This works perfectly w/ the Genesis Infinity Pro theme. I used your codes as you mentioned and was able to obtain full-width page, but when i select it as front-page in customizer, it again becomes boxed. I am using Magazine Pro theme for Genesis. Wondering if you could assist, using outreach pro, and have created landing pages using BB and Dambuster, Ive removed all navigation via Dambuster, but i am using SuperSlide Me for mobile navigation, and on the landing pages the nav still shows on certain breakpoints. Ive been told its display: none, but i have no clue where to put it. Can you provide one of the breakpoint widths at which the problem occurs?